I honestly can't get enough simulation building games, so finding out about Meeple Station was a bit of a treat. It's a space station simulation game, taking inspiration from Dwarf Fortress and Rimworld (with a hint of Space Station 13) with the nature of a real-time strategy game. 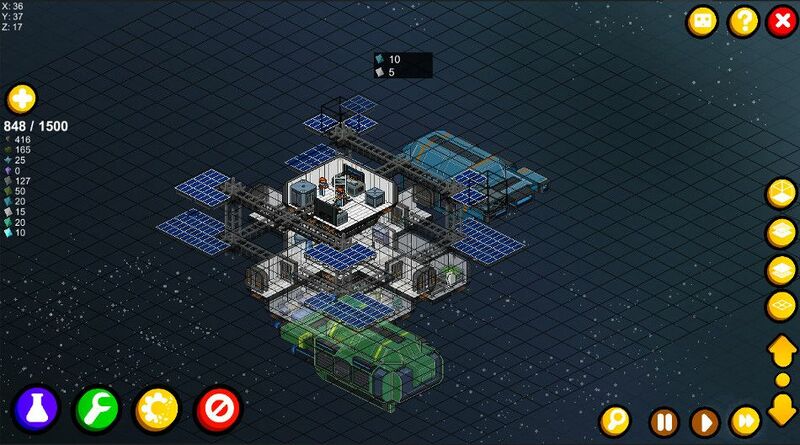 Although, while the developer doesn't say it, it does also seems to resemble Spacebase DF-9, the game from Double Fine Productions that sadly wasn't finished. It has a demo available right now on itch.io, which includes Linux support. Apart from an initial dodgy resolution (the usual two-monitor issues) it does seem to work fine. Once put into fullscreen mode, it did use the correct resolution so that's nice. The demo doesn't have saving and loading and only had a tutorial so it is a little limited. Your station is run by Meeple, space creatures who aren't human and not particularly intelligent either. It's your job to give them the orders, although you don't have direct control over them. They're fragile too, as they can fall victim to starvation, suffocation, implosion, explosion, decapitation, electrification, incineration. You will need to defend you station from natural disasters, space pirates, deal with traders coming to your station, mine resources floating around in space and explore where no Meeple has gone before. In regards to it being "cooperative", as I understand it the full version will have multiplayer features. It should be heading to Kickstarter next month. After playing the demo, I see a huge amount of promise with it and will be keeping an eye out for when the Kickstarter begins. Check out the demo on itch.io now or follow along on Steam. Thanks for the tip in our Discord, madpinger. Ja, I spammed this one on discord. Sorta a remake of DF9 in a lot of ways. Hope it goes well, but we'll have a long wait to see. Interesting. From the description sounds good. May try out that demo. My wife refers to playing Guild Wars 2 cooperatively as "parallel play." I wonder if that's what Meeple Station will be like. This looks really good. I have a soft spot for multiplayer games too so this is probably an instant buy for me.